Elizabeth Dimon, Michael Small and Niki Fridh in Most Wanted. True, the host of National Public Radio’s current events quiz show, Wait, Wait … Don’t Tell Me!, has hardly been out of the public eye lately. Wait, wait, make that “out of the public ear.” But when he began the show 20 years ago, he stopped writing plays, and if you want to measure the size of that loss, head to Florida Atlantic University this week, where his easy-to-identify-with comedy, Most Wanted, is receiving its world premiere from the university’s resident professional company, Theatre Lab. The writing of Most Wanted predates Sagal’s move to NPR. Surprisingly, although the script has long since been published, no theater has ever produced it. How fitting that this tale of grandparents who abduct their own infant granddaughter just to spend more time with her, hightailing it to the Sunshine State, would finally be realized onstage at FAU. For one thing, Theatre Lab’s producing artistic director Louis Tyrrell was an early champion of Sagal’s work (Denial, What to Say). And if Most Wanted wasn’t written with Tyrrell’s senior-skewing audience in mind – it wasn’t – it might as well have been. As if to lure us in before he turns serious, Sagal begins Most Wanted with a broadly comic tone. We meet long-married Doris (Elizabeth Dimon) and Frank (Michael H. Small), on the lam with baby Julia in tow, pursued – they correctly assume – by the police and by their staunchly unreasonable, unappreciative daughter Izzy, Julia’s mom. Although they hail from Delaware, Doris and Frank could be quintessential Floridians, pinching their fixed-income pennies at a roadside motel where Doris blithely lies to get the single occupant rate. 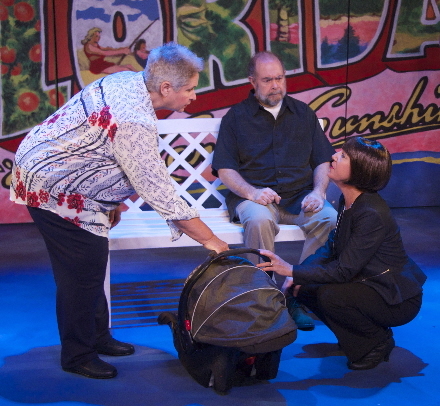 On their way to the bottom of the state, to end-of-the-road Key West, they encounter a variety of eccentric Florida characters, all played by Matt Stabile, Niki Fridh and Michael Gioia. Sagal has fun with the theatrical conceit of actors assuming multiple roles, as Doris and Frank swear they have seen these new characters previously. Ultimately, Most Wanted is about parenting, about people thrust into child-rearing without an operator’s manual, doing their best but making mistakes, engendering resentments that no amount of therapy can erase. Who couldn’t identify with this? Interestingly, Sagal had not yet become a parent by the time he wrote this play, but his observations on the subject ring very true. Tyrrell directs the production, casting it with local performers he has been closely associated with over the years. With a close-cropped gray coif, Dimon is particularly apt as Doris, amusingly puzzled by the eccentric strangers she meets, pragmatic at all times if unsure what lies ahead, rationalizing her actions which, after all, do amount to kidnapping. Small is not a very versatile actor, but when the role is right for him, as it is with cranky Frank, he shines. The supporting players are all a stitch, especially Fridh as a vegan butcher and supremely difficult Izzy and Stabile doing quick-changes between an understanding, but increasingly exasperated cop and Izzy’s husband Gerard, overly eager to make peace between parents and daughter. Also delicious is Gioia as a play-the-angles Floridian and a spaced-out tour guide at the Truman Little White House in Key West. Scenic designer Michael McClain does a lot with the cramped quarters of Theatre Lab’s space, rolling out set pieces from behind a slide-away Florida postcard background. Dawn C. Shamburger’s costumes are regional gems and Matt Corey’s sound helps to situate the on-the-move action. In a larger, less design-limited theater, Most Wanted would probably be able to breathe a bit more, but Tyrrell’s production puts the emphasis on the words, as he has for over a quarter-century. Here’s hoping his world premiere of the play fosters others to mount it, and here’s hoping it encourages Sagal to get back to writing plays. MOST WANTED, FAU Theatre Lab, Parliament Hall, 777 Glades Road, Florida Atlantic University campus, Boca Raton. Through Sunday, Dec. 17. $35. 561-297-6124.